The best email subject lines are the ones that stand out in a subscriber's inbox. Personalization can make your audience feel valued and affirms that your content is relevant to them. Research also shows that personalization leads to more email opens and clicks. Learn how to use personalization in the subject line of your HubSpot marketing emails below. 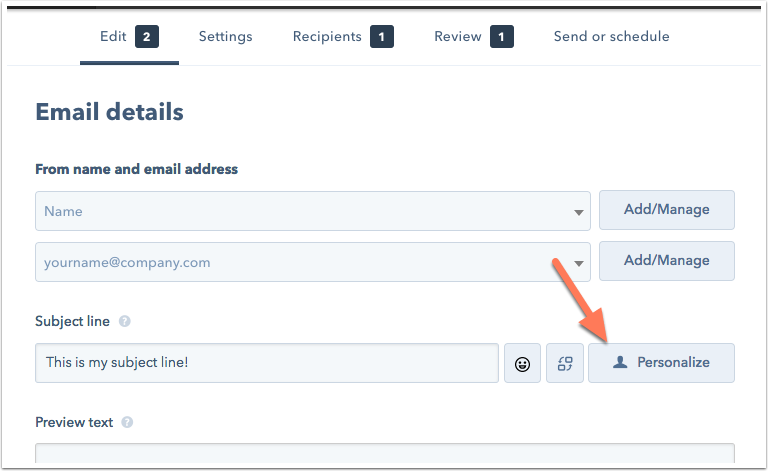 In your HubSpot account, navigate to Marketing > Email. Hover over the name of the email you want to edit and click Edit, or click Create email at the upper right. In the email editor, click Edit details. Locate the Subject line field and click Personalize. In the dialog box, click the Type dropdown menu and select Contacts or Company. Click the Property dropdown menu, and select the contact property or company property you want to use. Add a local default value or choose to Use this property's global default value. Click Insert.